Universidad Politécnica de Madrid will be hosting a dissemination event on 28 April 2015. 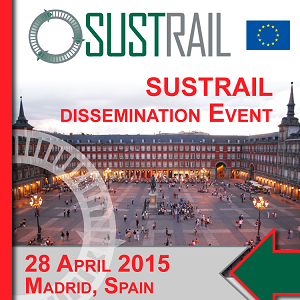 Specifically intended to disseminate the results of the project towards the freight, infrastructure, and rolling stock experts based in Spain and in the southern part of Europe, this workshop will give a brief overview on the project background and objectives and will showcase the innovations developed in SUSTRAIL to achieve the main objectives of the project. Moreover it will address Spanish specificities with top level officials from the Ministry of Transport, Spanish rail freight operators, and infrastructure managers. Finding convergences between SUSTRAIL project and R&D agenda from PTFE.